Written by Dr. Abdul Samieh Deva and medically reviewed by iCliniq medical review team. Acne is a disorder of pilosebaceous unit found in the skin. Sebaceous gland is often associated with a hair follicle and is known as a pilosebaceous unit. The most important lesion in acne is a comedone. Besides, papules, pustules, and nodules are also found. In common terms, these are all known as pimples. The sites of pimples include face, chest, back, and shoulders. Pimples are caused by various factors like androgenic hormones, inflammation, Propionibacterium acnes, etc., acting on the pilosebaceous unit. Initially, a block develops in the glands' opening, and later, the unit ruptures into the dermis as a result of the pent-up sebum, thus aggravating the condition. I Get Blackheads as Well. What to Do? Most parents or even patients themselves, after having complained about acne or pimples add that my child gets blackheads as well. Blackheads actually mean open comedones and are thus a part of the overall disorder. Comedones are of two types: open and closed. Open comedones turn black, probably due to exposure of sebum to air. Pimples Do Occur in Teenage. Do We Need to Treat Them at All? This is one of the most commonly asked questions by the parents. They are either well versed about the self-limiting nature of the disorder beforehand or develop this understanding while in the course of the discussion. They thus conclude that treatment is not necessary. I, however, tell them that this conclusion is incorrect. Acne most commonly does start in the teenage and heralds the onset of puberty. In girls, it may start a year prior to the onset of menstruation. Acne is self-limiting as well, but treatment is definitely required as it can get aggressive and cause scarring if left to resolve by itself. The scarring may last a lifetime. I Applied Many Creams Without Relief. Why? You may be using a topical steroid. Unfortunately, topical steroids are available over the counter in many countries and are thus used by all patients invariably before consulting a dermatologist. By virtue of their strong anti-inflammatory action, they are able to suppress acne. But once stopped, a severe rebound occurs so that you are forced to apply it again. A vicious cycle of steroid application and rebound acne sets in, which damages your skin. If you are using a steroid on your face, stop it and seek help. You may be using an over-the-counter preparation which may not be appropriate to the severity of your condition, or you may have developed resistance to the treatment. You may be using an irrelevant drug for your pimples. You may be insufficiently using an otherwise effective medicine. I have seen all the four instances in my practice. How to Apply the Medicine? for How Long Would the Treatment Continue? The duration of the treatment will depend on the severity of the condition. Dermatologists use many classifications to grade the severity of acne. In simple terms, it may be divided into mild, moderate or severe type. A combination of treatment options is usually used to ward off resistance to treatment. Many drugs used need close supervision by a dermatologist and the method/manner of application depends on the drug used. Your skin may have areas with pimples and areas without pimples. The area without pimples looks normal, and patients usually do not apply the medicine in this area. However, the correct approach is to apply a thin film over both the areas. Sunscreen lotions and moisturizers are to be applied liberally. Sunscreen lotions are to be applied during the day. Ask your dermatologist for the exact technique and take this only as a general guideline. What Are the Dietary Recommendations on Acne? There is no evidence to support that any specific diet aggravates acne. Though some studies point towards chocolates and dairy products. With the advent of bad dietary habits, it seems prudent to advise that one must eat a balanced diet comprising of proteins, fats, carbohydrates, and fiber and keep processed foods like sugar, junk foods, fruit juices, etc., to a minimum. The diet you take should be decided by your age, gender and level of activity. My Child Worries Too Much About Her Skin. Is This Not a Small Issue After All? Acne is associated with significant psychiatric morbidities in almost half the teenagers. It has also been associated with significant impairment in functioning including job prospects. What may seem insignificant to some, may significantly affect others. Some children may need counseling as well. Stress aggravates acne and acne aggravates stress. It is a kind of vicious circle that needs to be broken. The take-home message is NOT to neglect the psychological aspect of any disease and pimples are no exception. Is Acne Associated with Any Other Diseases? Most of the times, acne is a straightforward clinical diagnosis. However, in some cases, it may be associated with some other diseases. If you have a sudden onset of pimples, a severe disease, poor response to treatment, menstrual irregularities, deepening of the voice, excessive hair growth, or hair loss, etc., your dermatologist may have to order certain lab tests to check your hormonal status or insulin resistance. Do a gentle cleansing twice a day. Apply moisturizers on a wet face. If under stress, seek help. Do not pinch or burst the pimples. Do not apply over-the-counter medications if you are unsure about their proper use. 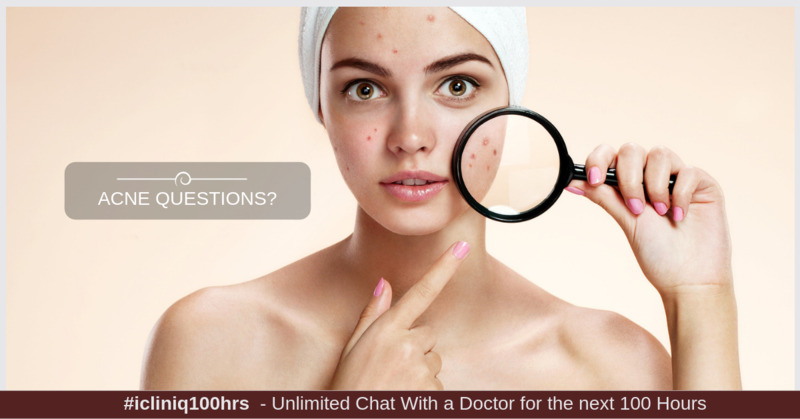 Do you have a question on Acne or Acne Vulgaris?